(Bloomberg) – A South African judicial commission faces a daunting task in investigating allegations that members of the Gupta family and their allies connived with former President Jacob Zuma and his son Duduzane to loot billions of rand from state coffers. Its success or failure will go a long way in determining whether South Africa can put behind it years of mismanagement and plunder during Zuma’s scandal-ridden administration that undermined investor confidence and stymied economic growth. Zuma agreed to the inquiry after losing control of the ruling party and a lawsuit challenging a directive from the nation’s former graft ombudsman that spelled out its powers and appointment procedures. Deputy Chief Justice Raymond Zondo and his panel of six senior staff members must probe an array of deals between state entities and private businesses, some of them set up to obscure the intended beneficiaries. 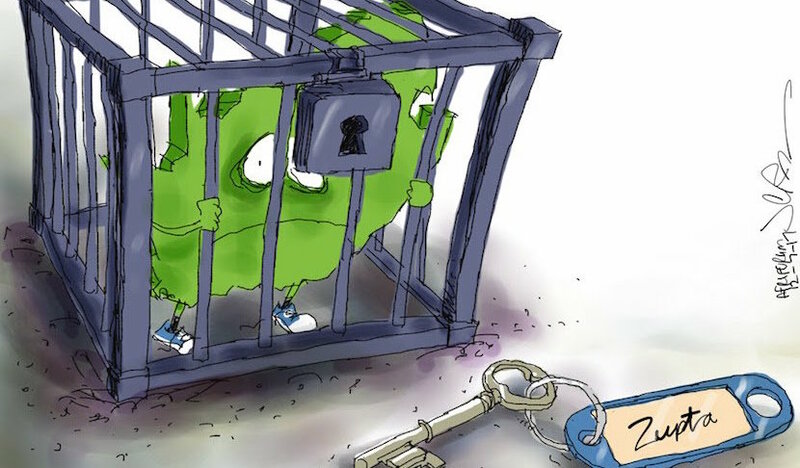 It will require wading through hundreds of thousands of documents and interviewing scores of witnesses, many of who may be reluctant to give evidence because they risk implicating themselves. Several key players, including the three Gupta brothers and Duduzane Zuma, have fled the country. 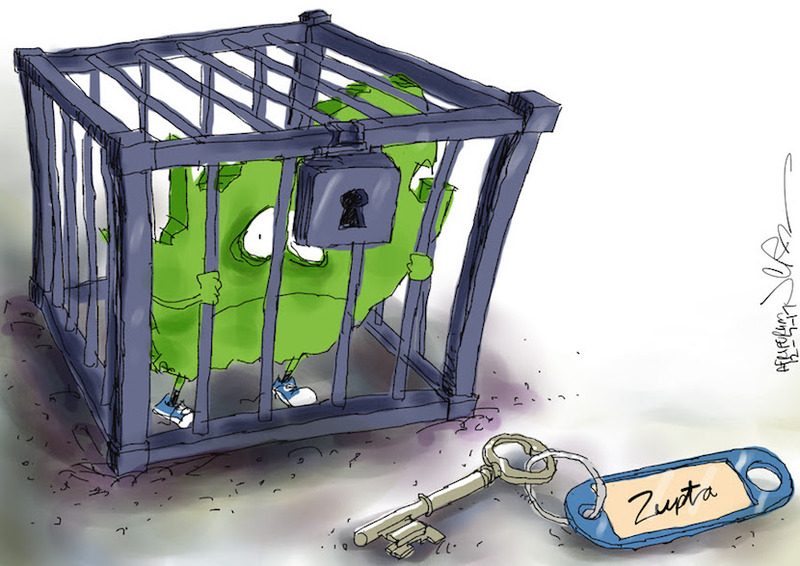 “South Africa captured by the Zuptas.” More magic available at jerm.co.za. Former Deputy Finance Minister Mcebisi Jonas and Vytjie Mentor, the ex-chairwoman of parliament’s public enterprises portfolio committee, alleged that the Guptas offered them ministerial posts in exchange for business concessions. Jonas said he was also offered a 600-million-rand ($50 million) bribe. The Guptas denied making the offers. Zuma, forced from office by the African National Congress on Feb. 14, said he never delegated the right to make cabinet appointments to anyone. A sign stands at the entrance to the Optimum Colliery, in Middelburg, South Africa, on April 13, 2016. 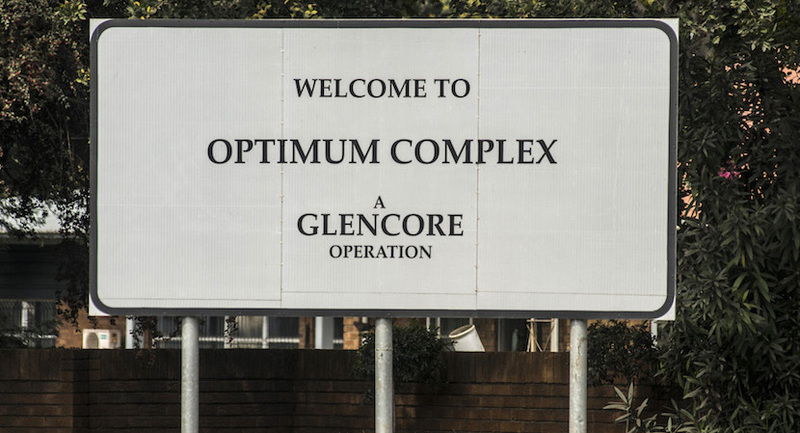 Glencore Plc agreed to sell its Optimum coal mine to Tegeta Exploration and Resources Ltd., a company controlled by the Guptas, for 2.15 billion rand in 2015, with Zuma’s mines minister, Mosebenzi Zwane, traveling to Switzerland to help seal the deal. State power utility Eskom Holdings Ltd. helped finance the transaction in contravention of government rules, according to the Treasury. The Guptas said the agreement was above board, and Zwane said he was trying to save jobs. The mines have subsequently been placed under business rescue. Eskom paid McKinsey & Co. and local partner Trillian Capital Partners Ltd., which was controlled by Gupta associate Salim Essa, almost 1.6 billion rand in consulting fees. The National Prosecuting Authority and Eskom’s new management have said the payments were illegal and should be repaid. While McKinsey agreed to refund the money, Trillian has said its contract was valid. Companies linked to Essa and the Guptas received 5.3 billion rand in kickbacks to help a unit of China South Rail secure contracts to supply state railway operator Transnet SOC Ltd. with new locomotives, according to leaked emails obtained by the amaBhungane Centre for Investigative Journalism and Scorpio, the Daily Maverick news website’s investigative unit. 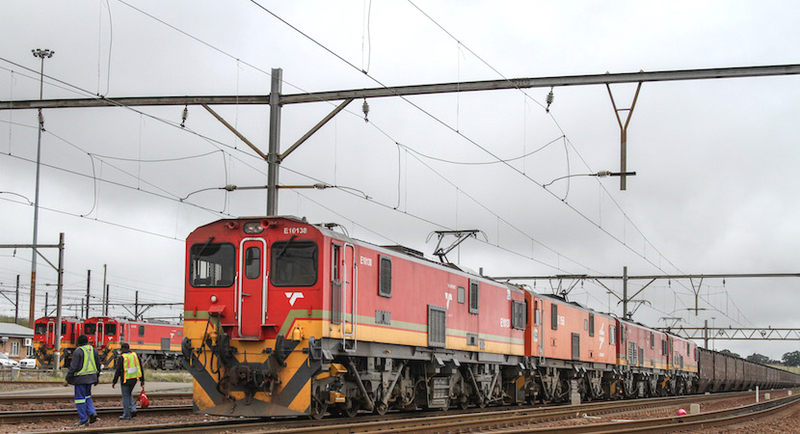 Law firm Werksmans, which Transnet appointed to investigate the allegations, recommended that law-enforcement agencies look into the deal and that officials who approved it should face disciplinary action. Transnet said the Werksmans’s report was “inconclusive” and its board decided to take no action — a decision rejected by then Public Enterprises Minister Lynne Brown. Essa and the Guptas have denied wrongdoing. Estina Dairy Project. 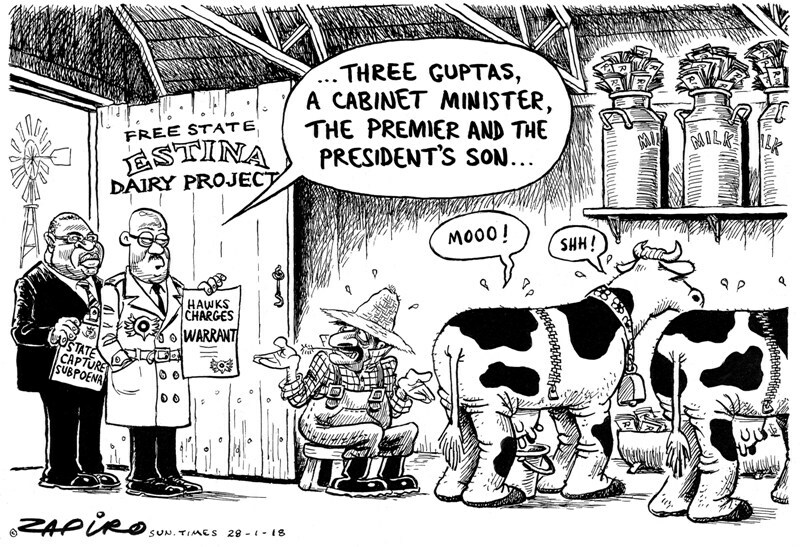 More of Zapiro’s brilliant cartoon work available at www.zapiro.com. A state-owned farm near the central town of Vrede was leased to a little-known company, Estina Pty Ltd., in 2012 under a free 99-year contract and the regional government agreed to help develop it, ostensibly to set up a dairy project that would create 200 jobs. Prosecutors say most of the 220 million rand in public funds transferred to the company ended up in the hands of the Guptas, an allegation the family denies.